This page allows access to online payment and ordering using major credit and debit cards. Joining instructions will be available to download after booking. The walk will start at Pen y Pass, at the head of the Llanberis Pass, and walk off road to Nant Peris. The Llanberis Pass is a stunning location with the great hills of the Snowdon and Glyderau massifs rearing up on either side of the route. The Pass itself is an ancient fault line, in part the boundary of the great Snowdon caldera, and a spectacular example of a U-shaped glacial valley. There are plenty of different rock types to be seen including air fall tuffs, intruded dolerite, welded tuffs, sedimentary rocks with fossils, breccias, flow-banded intrusive rhyolite and lava flows. Also there is a wealth of geological features, including a slice through a volcanic conduit that once carried molten magma towards the surface, and glacial features including hanging valleys, moraines, truncated spurs, ‘erratic’ boulders dumped by the melting glacier and post-glacial rockfalls. 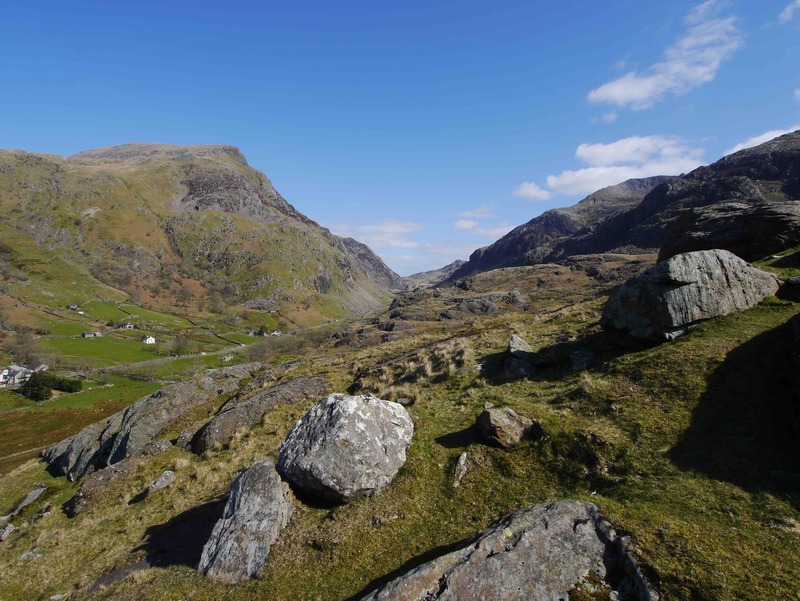 The range of geological and glacial examples encountered over such a comparatively short distance is exceptional and makes the Llanberis Pass one of the most exciting geological walks in Britain, framed throughout by glorious scenery. I will provide you with a guided walk at the announced location looking at the geology and scenery. The actual route on the day is dependent on weather and other conditions on the day and no route is guaranteed. I reserve the right to alter the routing and the location depending on weather and the welfare of the entire party. If I have to cancel the guided walk in advance I will provide you with a full refund. A file containing course notes and joining instructions can be downloaded after booking – if you have trouble downloading the file contact me by email and I will send you the file as an email attachment as soon as feasible. The course fee is payable by you on booking. If you want to cancel your booking I will refund 85% of the fee if you cancel at least 14 days before the course date. For cancellations with less than 14 days of notice there will be no refund. You will notify me in advance or at the start of the guided walk (in confidence) of any medical conditions you have and which I may need to know about given that the walks are on rough mountain terrain. The planned route for this walk is mainly downhill with minimal ascent but the terrain is rough and rocky and can be wet underfoot. For most of the route there is no track on the ground. Hillwalking can be a demanding and potentially dangerous activity and care must be taken to ensure your personal safety on the walk where the paths and tracks can be steep and stony. English & Welsh law will apply to this contract.